THE SHORT VERSION: To purchase embroidery designs from Wabei-mono, choose your format and click the appropriate “Add to Cart” button on the page for the design you wish to purchase. After you’ve checked all the pages and added all the designs you want, click “View Cart” and complete the checkout. An e-mail with download instructions will be automatically generated and sent to the address used to make the purchase. Follow the download instructions and then—Happy Stitching! THE DETAILED VERSION: When you see a design that you would like to purchase, click on the “add to cart” button for the format that is appropriate for your machine. Clicking the “add to cart” button will place that design in a holding area until you are ready to finalize your purchase. Be sure to choose the format that is appropriate for your machine. When you have finished shopping, click “view cart” to see the designs you’ve selected. If you’ve changed your mind about buying any of the designs you have selected, you will be able to remove items from your cart before proceeding to the check out page. When you’re ready to pay for the designs, click “proceed to checkout ” and you will be asked to sign into your Paypal account to complete your purchase. If you do not have a Paypal account: Paypal does not require you to have an account to use their service. They do require you to have a valid email address and a valid credit card. Simply select “No, I don’t have a PayPal account” then follow the instructions on the Paypal page to make the payment and continue to complete the order. Personal checks and money orders can not be accepted. Downloading your designs: Once payment is successfully completed, you will be re-directed to the download area. An email from Wabei-mono Designs will automatically be sent to the e-mail address that you used for your Paypal account. The e-mail that you receive will include links and download instructions for the designs you have purchased and should be sent almost immediately after payment has been completed. However, there have been customers who tell me that they have waited as long as 10 minutes for the e-mail to arrive. An image of the download screen is shown below. Notice that there are two blank fields. The first field is for your e-mail address. Be sure to use the same e-mail address that you used to make your Paypal payment. The second field is for the password generated and sent to you from Wabei-mono Designs. You may download your purchased designs up to three times. If you loose your password and need to access the download area to re-download your designs, please contact me for help in sorting out the problem. What if I don’t receive an email from Wabei-mono Designs? If you do not get an email within a few minutes, be sure to check your SPAM or BLOCKED folder to see if it was sent there by your email service provider. 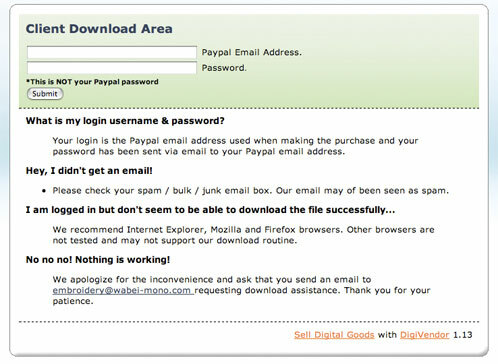 Be sure that you are checking the email box of the email address that you used when making payment to Paypal. I still haven’t received an email from Wabei-mono Designs and I checked my spam/blocked folders. What do I do now? Contact me using the contact page on this website and I will resend the links to the email address you used when making payment to Paypal. Bear in mind that there may be a considerable time difference between my home in Japan and where you live, so do allow time for me to receive your e-mail and get back to you. How many times will I be able to download the design files once I have received the email with links? Three times. Most people only need to download each zipped file once, but if you loose your designs due to a computer crash, a power outage or some other problem, you will be able to access the zipped file two more times as a back-up. You will only be able to download the file format that you have originally purchased. And always, feel free to contact me. My intent is to share the beauty I’ve seen during my life abroad and I do want to have happy and satisfied customers. First on my list, I want to thank the American Embroidery Conference organized by Dianne Pomeroy for teaching me so much about the joys of machine embroidery. I also thank the many digitizing teachers whose lessons I have been privileged to enjoy and all of the wonderful machine embroiderers who have so freely shared their tips, tricks and advice with me. All images, artwork and all designs on this website are copyright protected. License for use is granted to the original purchaser only and that license is not transferrable. You may not share, trade or re-sell these electronic files. You may embroider these designs on items for yourself, for gifts, or for sale. If you sell items on the internet using my designs, you must show a link back to my web site. Due to the nature of electronic media, all sales are final.